Program #ZINH042. Recorded in Sudbury, MA on November 10, 2009. 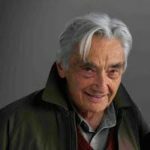 Spend an hour with Howard Zinn and more than 200 students and teachers at Ephraim Curtis Middle School in the Boston suburb of Sudbury. Howard Zinn speaks and then students ask questions. A delightful morning assembly.